In this chapter we see Samuel give Saul an instruction from the Lord to destroy ALL the Amalekite’s. Nothing was to be spared, yet we see Saul and his men choose to do what pleased them. They chose which part of the instruction to obey. Rather than kill ALL as God instructed they chose to keep the king and any other treasure they find worthy. The instruction to Saul was very simple yet he chose to disobey. This really broke God’s heart to the extent that God told Samuel He regretted making Saul King. That’s very deep. I’m not sure I read any where else in the bible where God specifically said He regretted a decision He made. That’s how much Saul’s disobedience aggravated God despite the fact that Samuel warned him and Israel (during his coronation) to be loyal and faithful to God; and to obey His commands. 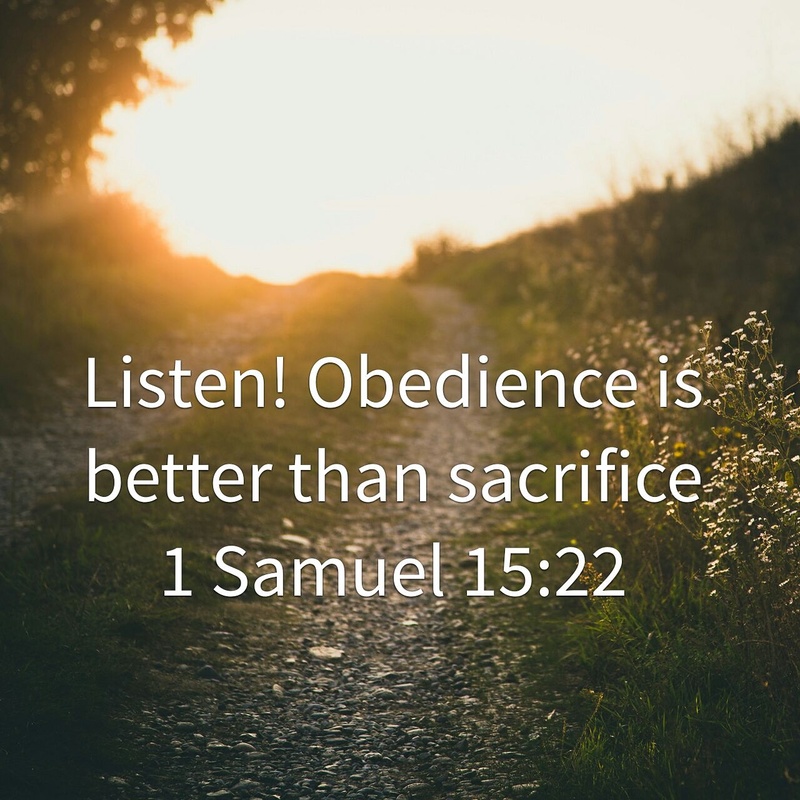 Samuel met with Saul and challenged him regarding his disobedience to the Lord’s command. Saul replied that he obeyed. His rationale for keeping the animals was so he could offer sacrifices to God. Now my question is, did God ask him for the sacrifice? If God needed sacrifices why didn’t he tell him to keep the animals in the 1st place. I wonder how many times we assume we know better than God. Instead of us to obey Him plain and simple, we twist His commands to suit our selfish motives. This action cost Saul not only the throne but to be completely rejected by God. He had no opportunity to repent. God was done with him completely. Obedience is definitely better than sacrifice. I’m praying for us that the grace of God will not expire in our lives, that the grace to be obedient the Lord will grant unto us. Thanks for joining today. Please feel free to leave your thoughts on the chapter. As I read through the chapter, I fell in love with verse 6. The verse gave me a renewed hope: just what I needed to start my day. I absolutely love how Jonathan trusted God to deliver them from the Philistines. 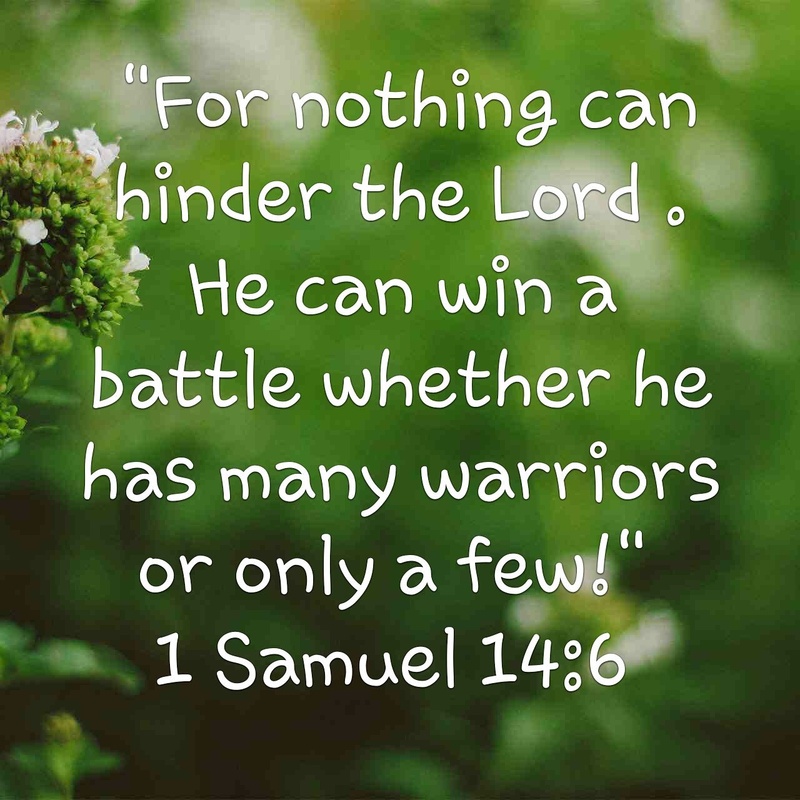 He understood that God can win a battle irrespective of the number of warriors available. He understood that their victory was solely dependent on God and not on human strength i.e the number of soldiers you have or weapons of war. “What wise courage in God! Many in Israel probably believed this as a theological truth. But few believed it enough to do something. Jonathan’s faith was demonstrated by his works. i. Nothing restrains the LORD! Do we really believe it? Or does the title of J.B. Phillips’ book describe us: Your God is Too Small. We often feel that God is restrained in one way or another. In reality, the only thing that could be said to restrain God is our unbelief. In Matthew 13:58, it says of one time in Jesus’ ministry, He did not do many mighty works there because of their unbelief. God’s power is never restrained, but His will may be restrained by our unbelief. He may choose not to act until we partner with Him in trust. God had a trusting partner in Jonathan! ii. By many or few: What did it matter? Who cares about the odds or the point spread when God is on your side? The odds were already against Israel. Did it matter if it was a million-to-one or a thousand-to-one? Numbers or odds did not restrain God, but unbelief could. Jonathan never read the New Testament, but he had a Romans 8:31heart: If God be for us, who can be against us? I want to encourage someone today. God knows your struggles, so rather than trying to fix them yourself why not give them over to Him. Let God fight your battles for you. No matter how big the battle may be, God is more than able to give you victory. Don’t rely on your own strength or the strength of man. Put your hope and trust in God completely like Jonathan did. Psalms tells us that those who put their trust in God will not be put to shame. Luke 1:37 tells us that with God all things are possible. Today why not put your trust in GOD and see Him fight your battles for you and give you victory. Thanks for joining today. Pls feel free to leave your thoughts on the chapter.